Finding Treasures in the Dust — Bring It Up! Through the scorching heatwaves that blurred the dusty Indian plain before me, I saw them coming in the distance, their vibrantly colored silks shining through the grit and heat like flames on the horizon. As they drew closer, the sight of them pierced my heart like a sword: they were crawling. Painstakingly and in suffocating heat, they inched their way to the wheelchair distribution held by the disability ministry of Joni and Friends. I rubbed my eyes to clear away the film of dust and saw their faces more clearly: they were smiling bright, joyful, downright happy smiles in spite of their gnarled legs and calloused knees and hands. Dropping the tools of my trade as an international journalist, I ran through the heat and dust of that Indian plain to meet them. When I reached them, we hugged and laughed, tears of joy inexplicably rolling down our faces. I knew instinctively that God had something transformational to teach me through these beautiful two sisters. 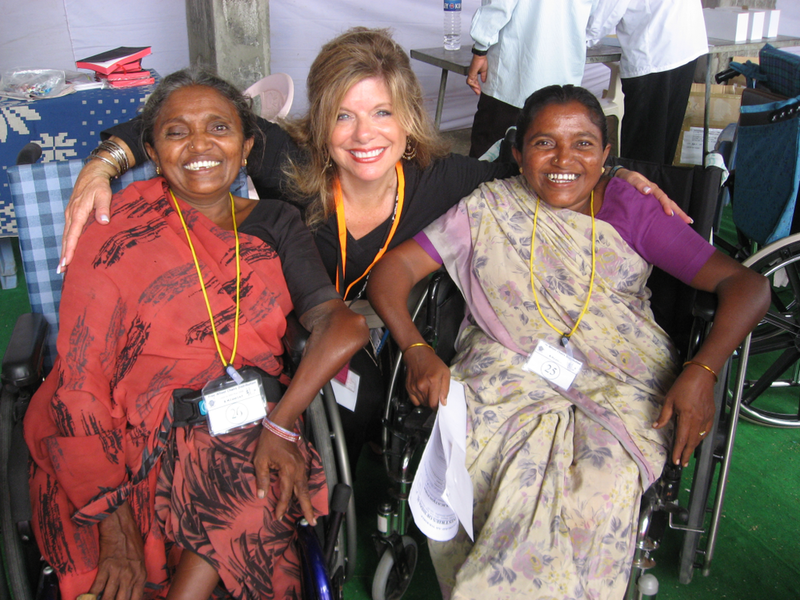 As their wheelchairs were prepared, I learned that Dapuri and Basavaya had known Jesus all their lives. Their mother was a devout Christian and they had attended church in their tiny village outside Ongole, India, for over 50 years. How did they get to and from church? They crawled. For 50 years. Their joy had suddenly made sense: it was supernatural, other-worldly, divine. It was Jesus shining out of them. For 19 years I worked for Joni and Friends, traveling to the harshest places on earth to interview and serve children and adults affected by disability. Whenever I’ve seen this kind of joy in someone who has no earthly reason to be joyful, it’s always because Jesus lives inside. I’ve been to countless countries and seen it over and over again. The question is, when will I learn what they know so well? As they wheeled together out the door in their new wheelchairs, Basavaya and Dapuri turned to us and waved goodbye. Their smiles were just as bright and joyful going out “in style” as they had been when they crawled in. At the sight of them, Truth penetrated my soul. “I have learned in whatsoever state to be content,” says Philippians 4:12. These women were the living, breathing Word of God — brighter and more brilliant than any polished sermon. Their joy didn’t depend on their circumstances or their comfort. Crawling or wheeling, these sisters had joy unspeakable and full of glory that supercedes any pain or disability, any lack or stigma. This picture of Dapuri and Basavaya now sits on my desk in a place of honor. They are my treasures. I never want to forget them because I’m sorely tempted by living in the lap of Western luxury. I’m tempted to compare. I’m tempted to believe I “need” so many things. I’m tempted to ask God to remove every hindrance, challenge or hint of suffering. I’m a terrible patient when I’m sick and I have no patience with pain. A glance at Dapuri and Basavaya teaches me all I need to know. It is well with my soul. I have been redeemed and restored. I have been given all the riches of Christ Jesus. What do I truly need? His grace, which is enough. His power that’s made perfect in my weakness. His Father love that calls me His very own. The world is a hectic, frantic place. We’re running as fast as we can to keep it together. My prayer is that Bring It Up with Deb & Cindy will refocus us all on what’s real, what’s important, what’s right and true and good. Sure, there will be days when we’re riding high and days when we’re crawling in the dirt. Let’s Bring It Up… let’s talk about it. But most of all, let’s understand what matters most. So that when the heat gets turned up and the dirt is flying all around us they’ll see us coming — our joy shining out in front like a blazing light that cannot be dimmed.